"Self, Good Day. ": Tut, Tut. It Looks Like Rain. Hey, so remember those Thanksgiving plans I had? Yeah, there's already been a slight change. Today, I went to the Jelly Bean's (Jalyn's) apt. We were going to work on our History of Creativity projects together. So, I walked on over there at about 1:30. Her roommates and some friends were playing cards, so we joined in for a couple rounds. We were just minding out own business, when one of her roommates points at the windows and was like, "What the heck? There is water leaking through the window!" Initial thoughts included someone spraying a hose, the snow melting really fast, and a new swimming pool in the window well (okay, maybe that one isn't true). So, we casually start picking stuff up and putting on the couches, moving stuff away from the window, and opening the blinds to see what was happening. Jelly lives in the basement, so the window is up higher than most as demonstrated in the picture below from when I lived in yes, the exact same apt. When we open the blinds, we see that a couple of inches of water had collected in the window well. We thought that was pretty strange. Suddenly, the water started coming in more quickly. It was like it was raining through the windows. So the girls started getting a little confused. They ran to their rooms and saw that the same thing was happening with the windows in there. They started unplugging electrical things and putting it on the tops of their beds and on their desks. They got stuff off the floor for the most part, but the water wasn't stopping. So we started getting stuff out of the apartment and up to the lobby of the building. We were mostly concerned about the electrical stuff and the expensive stuff like laptops, cords, etc. The water still wasn't stopping and everyone's beds were getting soaked. We went upstairs and looked outside to see what the heck was going on. It just didn't make sense. We looked outside and saw water flowing down from Upper Heritage. Upper Heritage is kind of up on a hill, so the water was basically flowing down a hill toward all the buildings in Lower Heritage. That's when we knew it was bad. We ran back downstairs and just started trying to get everything out. We recruited a bunch of people from other buildings to come and just get anything and everything we could out of the apt. Two of the girls were gone for Thanksgiving Break, so we went through there room and got all the valuable stuff we could out of there. The beds were getting wet, all the pictures on the wall were soaked. It was chaos. There were people running around everywhere. All of Jalyn's food storage that was under her bed was floating into the kitchen. We could see through the windows and the water level was above what we could see. It was sort of like being trapped in a car with water all around you...crazy stuff. It was churning in the window wells, so we could tell that water was still coming at very fast rates. For about five minutes we just got everything we could out of there. Then people came down and were shutting off those electrical switches (I don't know what they're called). 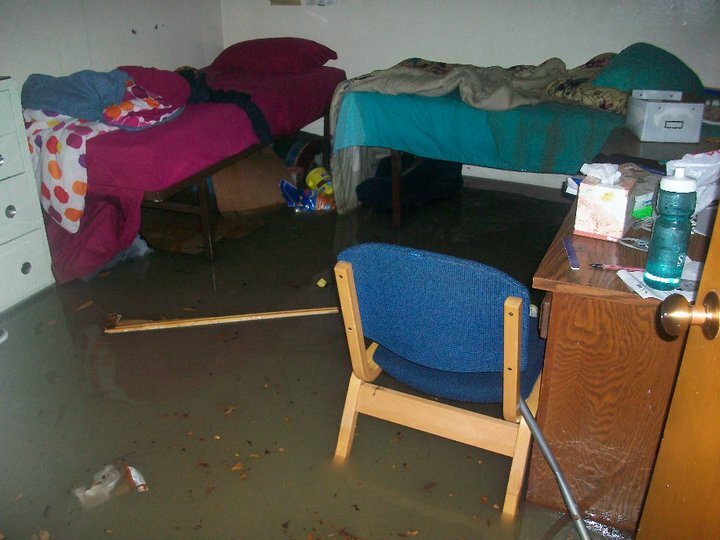 Water was leaking faster and faster through the windows, soaking every desk and dresser and the drawers in them. Most of us were barefoot and running through inches of FREEZING cold water. The water had flooded out the apartment and was headed across the hall to the other apartment. Someone came down and told us we had to get up to the main lobby. It seems to me that it was about as soon as everyone was out of the apt and headed up the stairs when the windows broke and it all came crashing in. The doors were breaking off closets as it just came rushing in. I've never seen anything like that before. They evacuated everyone from the building and turned off the power. The girls got hardly any of their clothes out, so we were just walking around barefoot and in wet clothes. The water got up to mid-calf and water was flowing quite steadily as we roamed for a place to sit and warm our feet up. We finally found a place and the girls started talking about how crazy that whole thing was. When we left the building, the basement was at least 3 feet deep with water. Looking back know, I don't know why we didn't get out sooner. That would have been so bad if we had still been there when the windows broke. When I was walking home, I couldn't even cross the streets because there was so much water flooding the streets. I had to walk a couple blocks south before I could find a place where I could jump the water and get to the other side. Ridiculous. I called Jalyn a little bit ago. Their apartment got it worse than any other apartment in all of Heritage Halls because they were right in the middle of most northern part of Lower Heritage. All the water from Upper Heritage ran down a couple of staircases and just flowed right toward her apartment. It turns out a couple of the windows broke and the wall between two of the rooms gave out. Sad day. I guess her room made out the best out of all of them, with little damage to her clothing. I guess the insurance people are coming soon to see the damage and how much stuff has to be replaced. It's going to be crazy for a while. I think most people will get to live in their apartments again soon, but not Jalyn and her roommates. I guess they are going to be temporarily relocated to Helaman Halls for who knows how long. I just hope they all get to stay together and that they get to move back soon! I'm so sad my old apartment has been somewhat destroyed. This is what it looked like back in my day.